Asymmetric, uses one main wire shape, heart and star with a 2″length of leather between the grip and the shape, we draw from a total of 8 shapes. As badge holder add -B to style number when ordering & an additional $1.00. 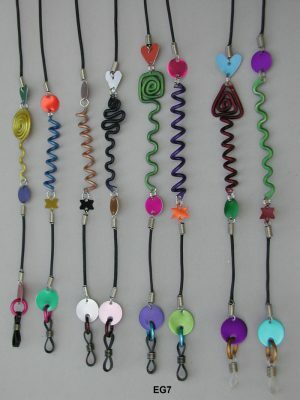 Wire shapes, star and heart arranged alternately with lengths of leather the entire length of the chain. Shown in Caribbean. 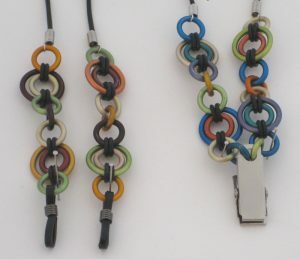 Asymmetric, uses 2 main wire shapes and aluminum rings as connectors, we draw from 12 wire shapes. Shown in Caribbean, New Pastel, New Cool, & Cool. Uses 1 main wire shape; we draw from a total of six shapes. 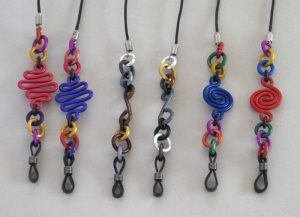 Asymmetric eyeglass leash with six colors. 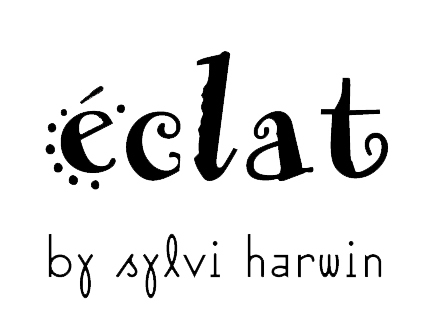 27″ Long. 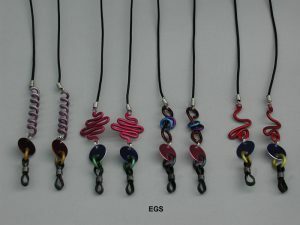 Eyeglass leash with six colors. 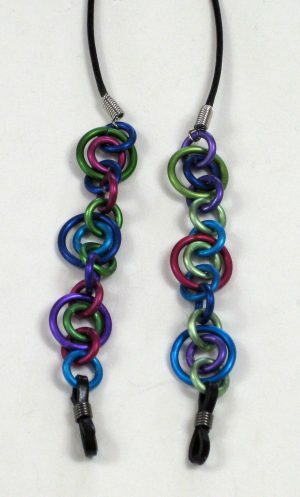 27″ long, multi-color rings. Shown in Cool & Tweed. 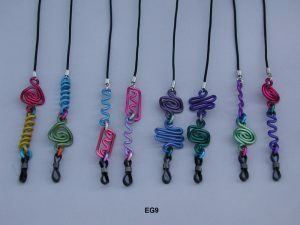 Eyeglass leash 27” long, 1 wire shape (offered with 8 possible shapes) with multi-colored rings, colors arranged asymmetrically. Shown in Primary, Basic, & Caribbean. 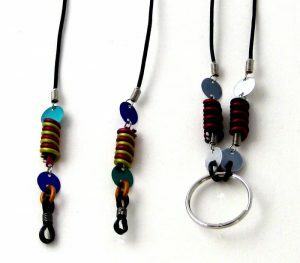 Eyeglass leash with loops of different sizes, colors arranged asymmetrically, 27” long, shown in Sahara (left) & Granada (Ba). 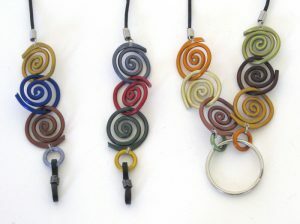 Eyeglass leash 27” long with interlocking wire swirls in 4 colors arranged asymmetrically on leather cord with adjustable eyeglass grips. Shown in Tweed & Sahara (Ba). 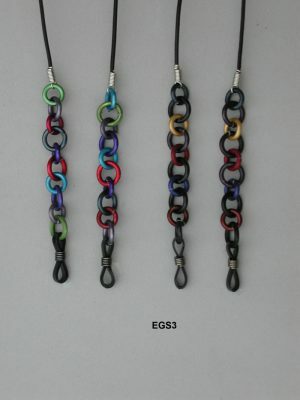 Eyeglass leash 27” long with adjustable grips, with colors arranged asymmetrically, shown in Bright, Vesuvio (Ba). 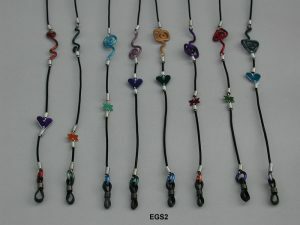 Eyeglass leash 27″ long in 6 colors, all closed loops, shown in Caribbean.